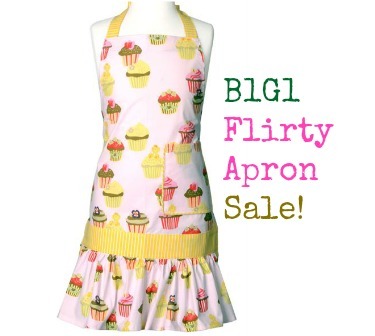 Make sure to check out Flirty Aprons to get Buy One Sadie Women’s Apron Sale, Get One Sadie Girl’s Apron for FREE. Use coupon code FLIRTYBOGO at checkout to get this deal. This sale is valid on the Sadie Apron Bundle, and there are several styles to choose from including the Sadie Brown Damask, Strawberry Shortcake, Blue Chocolate and so much more! These could be great gifts for Mother’s Day and Grandma might like one too. Make sure to add both aprons to your cart and $19.95 will be deducted at checkout once you use your coupon code. The adult apron is $29.95, so you will get each for $15! Offer valid through 4/30. Shipping is $4.93.